Georgia State School Superintendent Richard Woods took a walking tour of LaFayette High School last week, giving local education officials a chance to showcase programs making an impact in area classrooms and discuss how state representatives can better serve local communities. "I think that's best done by listening and not interjecting our thoughts and positions, but responding to what their actual needs are," said Woods. One of the initiatives Woods indicated a desire to support is Georgia HOPE's School-Based Mental Health Program, which has provided individual counseling, family counseling, diagnostic appointments and more to 126 students at LHS, in addition to the 3,000 other children served throughout schools in eight counties, including Walker and Catoosa. The program has helped to increase attendance, academic performance and disciplinary referrals within aided schools by more than 50 percent, according to data from Georgia HOPE. Jenny Wilhoite, director of the program, said the biggest problem is the need for additional staff. "We would be in every school if we had enough qualified professionals to actually be the school-based therapists," she said. "We've expanded as our staffing has allowed, and at times it's gotten to the point of me just waiting outside of UTC's graduating stage like 'Please come work for us.'" Wilhoite said measures as simple as being able to post about employment opportunities on the Georgia Department of Education website could bring real change, as well as having the state department refer job hopefuls to the program, much like Walker County Schools already does. An increase in staffing would allow the program to expand to more schools in Walker and Catoosa, which currently have a combined total of just over 10 schools being served by program. In regards to mental health, the tour also gave LHS a chance to shine a spotlight on Jag, a registered therapy dog that has been working closely with some of the students. 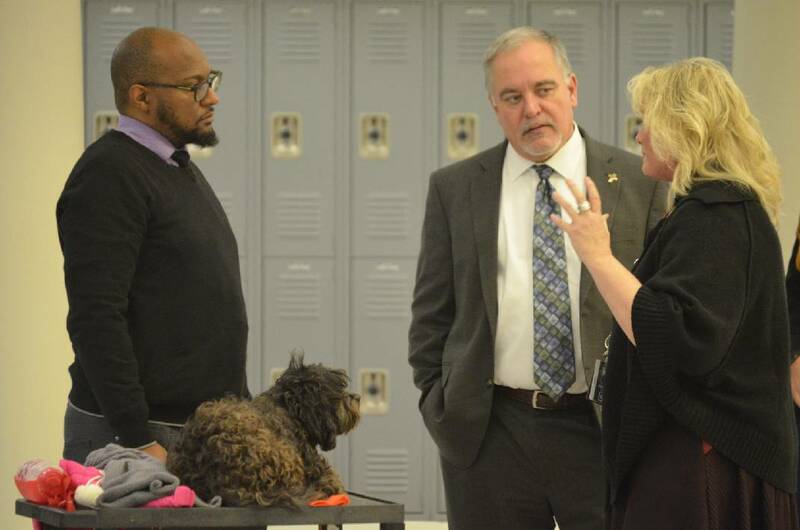 For about a year and a half, the Shih Tzu-poodle mix has been a cheerful sight throughout the high school's halls, with teachers incorporating her into classes from speech to biology. The ever-attentive pooch has been instrumental in providing calmness or a much-needed boost in confidence during lessons, said LHS inclusion teacher Beverly Hedges. She recounted a story from the classroom of special education teacher Kathryn Miller to illustrate her point. "Ms. Miller's got a child that doesn't socialize with other students or with very few people," said Hedges. "But Jag will come in, and she'll read to Jag and that's how Ms. Miller gives a grade." Hedges said she hoped to show Woods and other education officials present for the tour that therapy dogs can be "a positive addition to any school or district." "You never know what's going on in people's lives, and just that little fluffball can brighten people's day," she said. "It's unconditional love for everybody." Email Myron Madden at mmadden@timesfreepress.com.